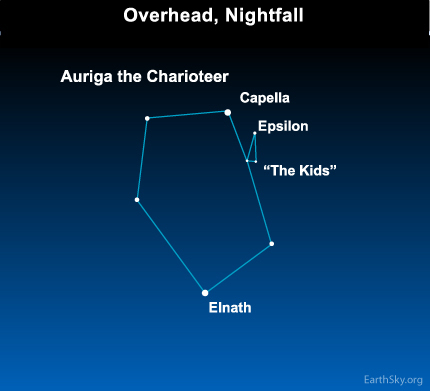 At early evening, look up high for the brilliant star Capella, the brightest in the constellation Auriga the Charioteer. Close to Capella, note the prominent triangle of starlets called The Kids. Lighting up the apex of this triangle is the star Epsilon Aurigae (Almaaz), one of the most mysterious stars in all the heavens. Although Capella looks much brighter than Epsilon, that is because Capella is so much closer. 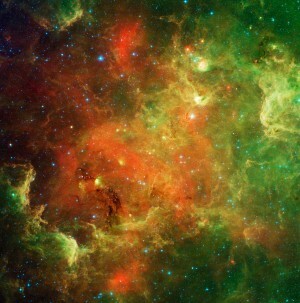 Capella resides about 42 light-years away, whereas Epsilon might be over 2,000 light-years distant. In cycles of 27 years, the light from Epsilon Aurigae dims for a period of two years. The star’s last dimming happened in 1982-1984. Epsilon is now in the midst of its 2009-2011 eclipse. Mid-eclipse has already passed, but the eclipse is predicted to continue until May 2011. Epsilon is an eclipsing binary star, meaning that some “dark” star routinely eclipses the brighter star. Astronomers are studying Epsilon Aurigae during its present dimming in an attempt to unlock its long-held secrets. Studies have shown that the dark body in this binary system consists of a star surrounded by a large disk of dust. However, questions remain and competing theories are vying to explain the age-old puzzle that is still Epsilon Aurigae, Auriga the Charioteer’s distant and mysterious star.